Although experimentation had always existed in rock music, it was not until the late 1960s that new openings were created from the aesthetic intersecting with the social. [jargon] In 1966, the boundaries between pop music and the avant-garde began to blur as rock albums were conceived and executed as distinct, extended statements. Self-taught rock musicians in the middle and late 1960s drew from the work of composers such as John Cage, Karlheinz Stockhausen, and Luciano Berio. Academic Bill Martin writes: "in the case of imitative painters, what came out was almost always merely derivative, whereas in the case of rock music, the result could be quite original, because assimilation, synthesis, and imitation are integral parts of the language of rock." In the late 1960s, groups such as the Mothers of Invention, the Velvet Underground, the Fugs, the Beatles, and the Jimi Hendrix Experience began incorporating elements such as avant-garde music, sound collage, and poetry in their work. Historian David Simonelli writes that, further to the Beatles' "Tomorrow Never Knows" (Revolver, 1966), the band's February 1967 double A-side single, pairing "Strawberry Fields Forever" with "Penny Lane", "establish[ed] the Beatles as the most avant-garde [rock] composers of the postwar era". Aside from the Beatles, author Doyle Greene identifies Frank Zappa, the Velvet Underground, Plastic Ono Band, Captain Beefheart, Pink Floyd, the Soft Machine and Nico as "pioneers of avant-rock". [nb 3] In addition, The Quietus' Ben Graham described duos the Silver Apples and Suicide as antecedents of avant-rock. The Beatles' album Sgt. Pepper's inspired a new consideration for experimental rock as commercially viable music. Once the group released their December 1967 film Magical Mystery Tour, author Barry Faulk writes, "pop music and experimental rock were [briefly] synonymous, and the Beatles stood at the apex of a progressive movement in musical capitalism". As progressive rock developed, experimental rock acquired notoriety alongside art rock. [nb 5] By 1970, most of the musicians which had been at the forefront of experimental rock had incapacitated themselves. From then on, the ideas and work of British artist and former Roxy Music member Brian Eno—which suggested that ideas from the art world, including those of experimental music and the avant-garde, should be deployed in the context of experimental rock—were a key innovation throughout the decade. 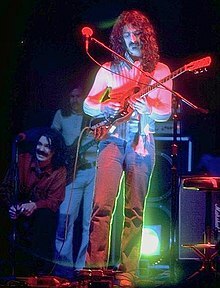 In the late 1960s and early 1970s, Germany's "krautrock" scene (also referred to as kosmische or elektronische musik) saw bands develop a form of experimental rock that drew on rock sources, such as the Velvet Underground and Frank Zappa, as well as wider avant-garde influences. Groups such as Can, Faust, Neu!, Amon Düül II, Ash Ra Tempel, Kraftwerk, Tangerine Dream, and Popol Vuh merged elements of improvisation and psychedelic rock with avant-garde and contemporary classical compositions, as well as new electronic instrumentation. The ideas of minimalism and composers such as Stockhausen would be particularly influential. The movement was partly born out of the student movements of 1968, as German youth sought a unique countercultural identity and wanted to develop a form of German music that was distinct from the mainstream music of the period. The late 1970s post-punk movement was devised as a break with rock tradition, exploring new possibilities by embracing electronics, noise, jazz and the classical avant-garde, and the production methods of dub and disco. During this era, funk, jazz-rock, and fusion rhythms became integrated into experimental rock music. Some groups who were categorized as "post-punk" considered themselves part of an experimental rock trajectory, with This Heat as one of the prominent players. The late 1970s no wave scene consisted of New York experimental rock bands that aimed to break with new wave, and who, according to Village Voice writer Steve Anderson, pursued an abrasive reductionism which "undermined the power and mystique of a rock vanguard by depriving it of a tradition to react against." Anderson claims that the no wave scene represented "New York’s last stylistically cohesive avant-rock movement." In the late 1980s, avant-rock pursued a "frazzled, psychedelia-tinged, 'blissed out'" aesthetic that differed from the self-consciousness and vigilance of earlier post-punk. The UK shoegaze scene was seen by some as a continuation of an experimental rock tradition. Pitchfork described contemporary acts My Bloody Valentine, Spacemen 3, and the Jesus and Mary Chain as "avant-rock icons." According to Paul Hegarty and Martin Halliwell, some 1980s and early 1990s avant-rock acts such as the British musicians David Sylvian and Talk Talk returned to the ideas of progressive rock, which they call "post-progressive". During the 1990s, a loose movement known as post-rock became the dominant form of experimental rock. In a reaction against traditional rock music formula, post-rock artists combined standard rock instrumentation with electronics and influences from styles such as ambient music, IDM, krautrock, minimalism, and jazz. In 2015, The Quietus' Bryan Brussee noted uncertainty with the term "experimental rock", and that "it seems like every rock band today has some kind of post-, kraut-, psych-, or noise- prefixed to their genre." ^ The Beach Boys followed Pet Sounds several months later with the single "Good Vibrations" (1966), credited as a milestone in the development of rock music and, with the Beatles' Revolver, a prime proponent in revolutionizing rock music from live concert performances to studio productions which could only exist on record. ^ Author Barry Miles commented on Pink Floyd, "They were the first people I'd ever heard who were combining some kind of intellectual experimentation with rock 'n' roll". Photographer John Hopkins remembers: "The band did not play music, they were playing sounds. Waves and walls of sound, quite unlike anything anybody in rock 'n' roll had played before. It was like people in serious, nonpopular music". ^ "EXPERIMENTAL ROCK (AVANT-ROCK)". The Independent. Retrieved February 16, 2016. ^ a b "Experimental Rock". AllMusic. Retrieved February 16, 2016. ^ "Pop/Rock » Art-Rock/Experimental » Prog-Rock". AllMusic. ^ The Editors of Encyclopædia Britannica (n.d.). "Post-rock". Encyclopædia Britannica. ^ Gillett 1984, p. 329. ^ Graham, Ben. "Repetition, Repetition, Repetition: Moon Duo Interview". The Quietus. Retrieved 17 September 2016. ^ John, Mike (July 4, 1970). "Review of the Velvet Underground at Max's Kansas City". The New York Times. Retrieved 19 September 2016. ^ "Classic Albums: The Velvet Underground - The Velvet Underground & Nico". Clash Music. December 11, 2009. Retrieved March 28, 2015. ^ Albiez, Sean (2016). Brian Eno: Oblique Music. Bloomsbury Publishing. p. 168. Retrieved 19 September 2016. ^ a b Foege, Alec (October 1994). Confusion Is Next: The Sonic Youth Story. Macmillan. pp. 68–9. ^ a b Leone, Dominique. "Massacre: Killing Time - Album Review". Pitchfork Media. Retrieved 17 September 2016. ^ Rodgers, Jude (2007). "Diamond Gazers: Shoegaze". The Guardian. Retrieved 18 September 2016. ^ Berman, Stuart. "The Horrors - Primary Colours". Pitchfork Media. Retrieved 17 September 2016.